As children we all played the cloud game, pointing out familiar animals and objects in the puffs of cumulus cotton. 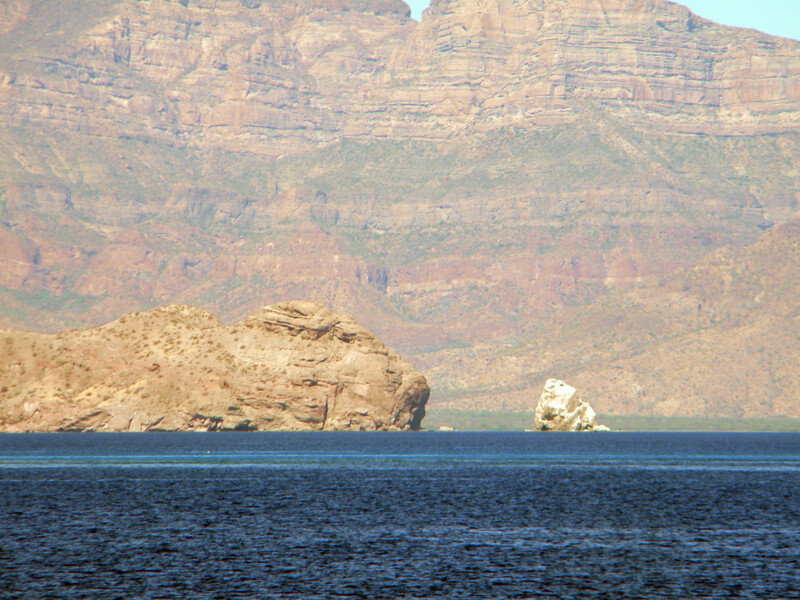 In the Sea of Cortez we play the same game but with rocks. We were two days out of La Paz, in Mexico’s Baja California Sur, chugging northward, when we began seeing things in the rugged landscape. “Do you see the monkey over there?” I asked, glancing to port. “The white one who looks like he’s sitting down. You see it, too? I was thinking that looked like a monkey!” She was amused that, despite the gender divide, both our brains had “seen” something simian about a pile of boulders rising from the dark blue sea. Look hard and use your imagination. Doesn&apos;t that look like a little monkey with his legs folded up in front of him with a big dog sneaking up from behind? The only natural sculpture that I can recall from my native New England was the Old Man of the Mountain. Though his face fell off Cannon Mountain in 2003, the granite profile continues to adorn the back of the New Hampshire quarter, his own two-bit memorial. Travel deep enough down the 800-mile Baja Peninsula, and you are certain to find the Old Man’s brother or cousin—maybe his entire beetle-browed family—keeping vigils of their own. A writer I know says he experiences heightened powers of observation when he goes to sea, the survival instinct of a creature away from his native element. Imagine, then, two people from the woodlands and suburbs of the Northeast on their first cruise in the Sea of Cortez. Not only are we two land dwellers gliding across a couple thousand feet of blue liquid, but it appears we are doing so on some other planet. 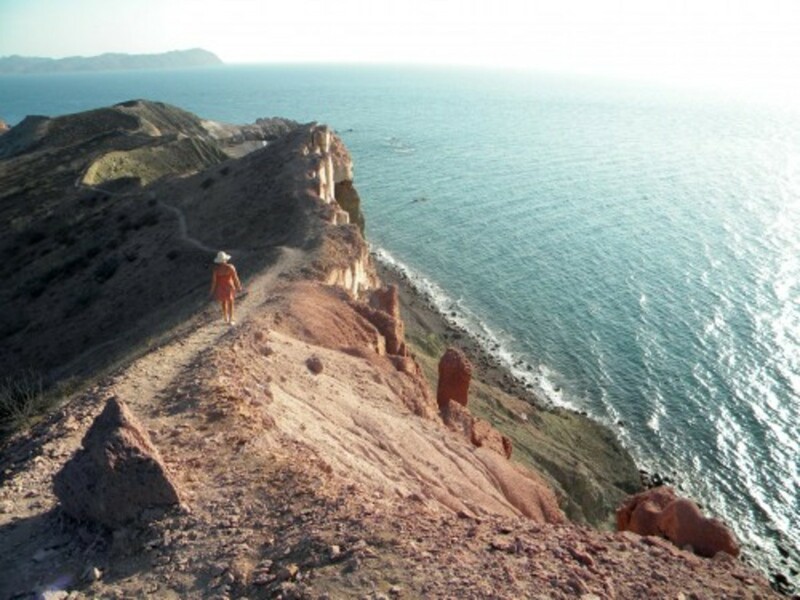 With the possible exception of the Red Sea, the Baja resembles nowhere else on earth you can take a boat. 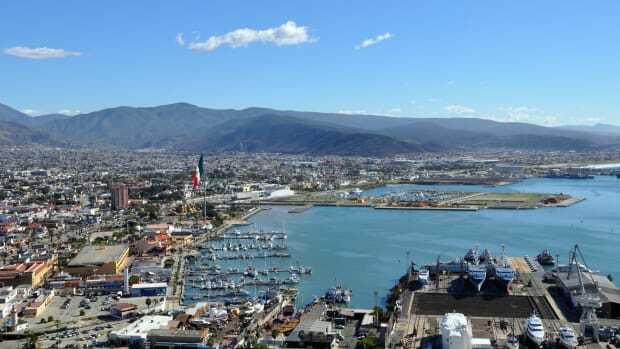 Given their over-familiarity with Western topography, I doubt our cruising brethren from California, though they love the Baja, can experience the region as intensely as we East Coast people. And in our particular case, we were doing so from the flybridge of a Moorings 47 Power Cat, a futuristic vessel with a commanding view of the lunar-like sea of tranquility that lay before us. 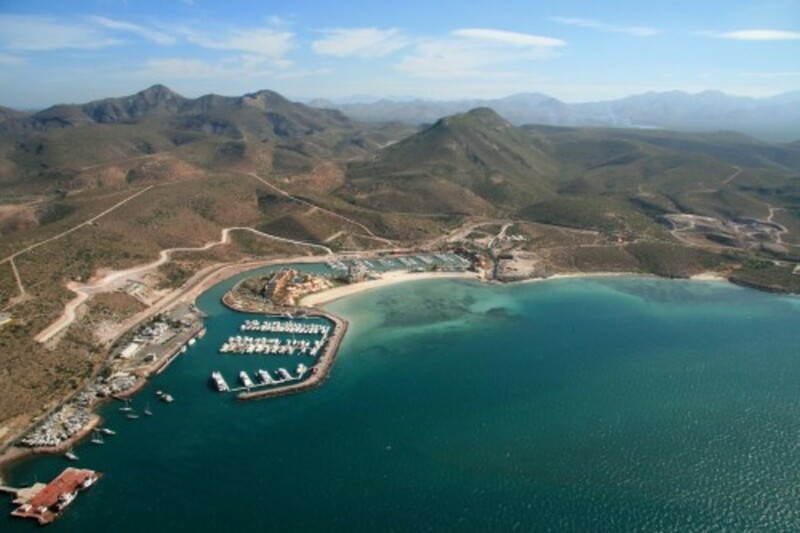 Costa Baja Marina is the Moorings Base for the La Paz region. For 20 years I’ve been an enthusiastic Baja fan. Flying into San Diego, I made several road trips part way down the peninsula, which happens to be longer than Italy. 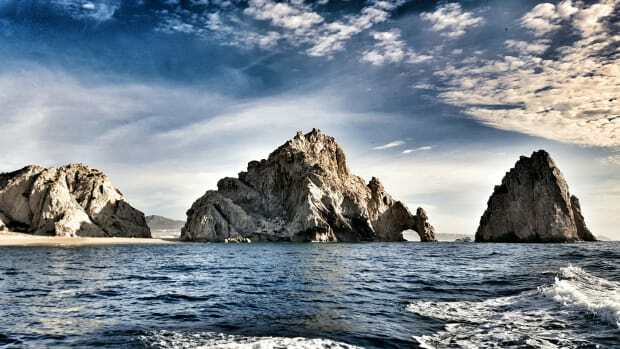 In 2003, I delivered a trawler from Florida to Ensenada (a Mexican port about 60 miles south of San Diego), and, though we stopped at Cabo San Lucas, I deeply regretted not having time for a detour up the Sea of Cortez. 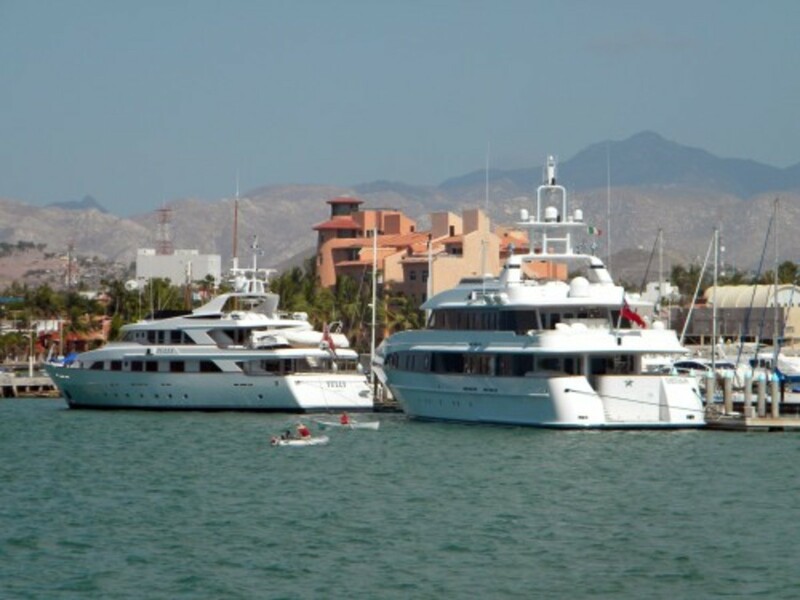 (See PMM, Dec.’10, “The Tehuano Two-Step.”) Realizing belatedly that my best chance would be to charter a boat, I turned to The Moorings, which has a base at Costa Baja Marina, the newest marina in La Paz. Good charter grounds share several features. They are beautiful. Reasonably compact in size, they have protected waters with numerous sheltered bays and islands to visit. Shoreside, there is town life with restaurants and shops. And there is an international airport not far from the charter base. This describes the Bahamian Abacos and the British Virgin Islands, and it describes the area from La Paz to Puerto Escondido, in the Sea of Cortez (also known as the Gulf of California). Fresh local ingredients contribute to the Baja Peninsula&apos;s reputation for great food and fine dining. No. 2. (Related to No. 1.) The fishing is so good that waters of the East Coast and Caribbean seem barren by comparison. Though not unique to the Baja, it should be noted that the people are friendly and like Americans. No, they really do. And being in the city of La Paz feels as comfortable as a well-worn pair of shoes. The water is clean, the streets are clean, and at the end of the working day, the city’s seaside boardwalk (in Spanish, the malecόn) comes alive with families and friends enjoying the gentle breeze and colors of sunset. We arrived for a weeklong charter in mid-August following the hundreds of other Moorings customers who have sailed before. 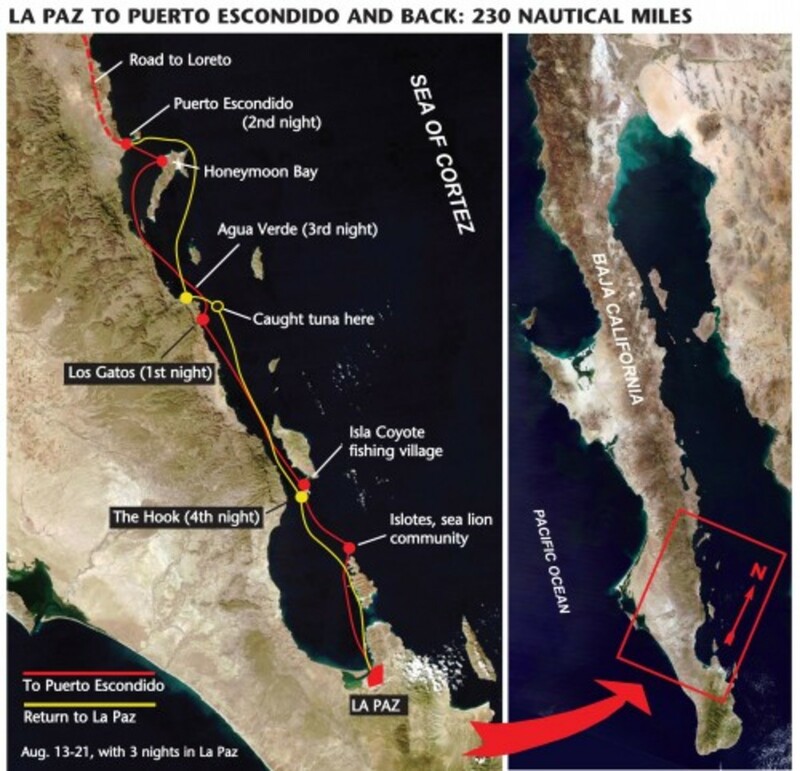 But the most famous person to have chartered in the Sea of Cortez did so nearly 70 years ago, long before The Moorings. Author John Steinbeck was at his peak, having just published The Grapes of Wrath, when he and his best friend, a marine biologist named Ed Ricketts, chartered a 76-foot sardine boat for a research voyage. 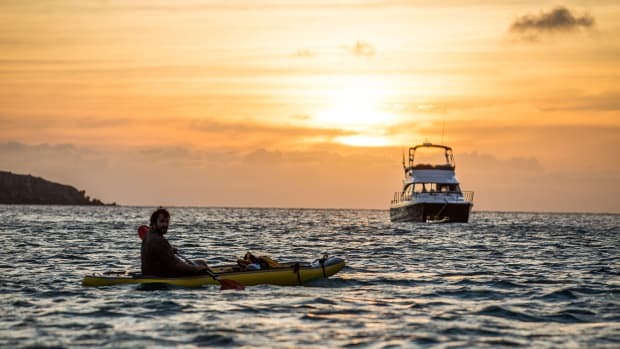 In their 4,000-mile trip aboard Western Flyer, Steinbeck, Ricketts, and four professional mariners ventured up and down the Sea of Cortez, including an eventful leg from La Paz to Puerto Escondido, the very same trip we had planned for ourselves. The Western Flyer expedition discovered several new species, but that was not the goal. 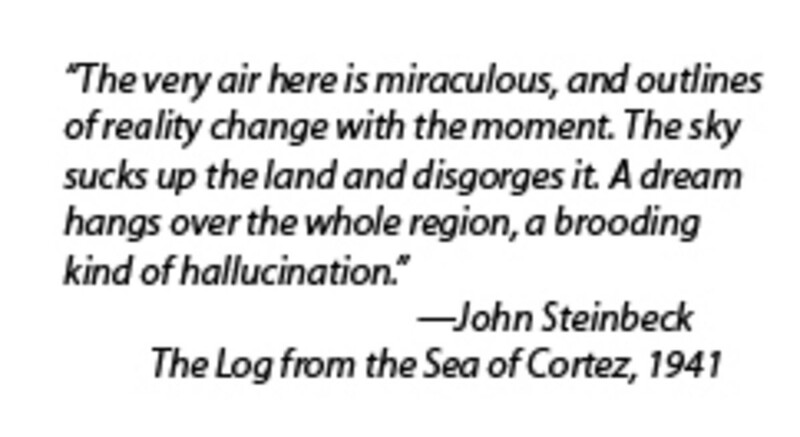 Steinbeck and Ricketts were early adherents to the notion of holistic ecologies that we take for granted today. They were more interested in seeing how different species in the inter-tidal zone related to one another—urchins, starfish, hermit crabs, etc. They collected thousands of specimens. “On the water’s edge of La Paz a new hotel was going up,” wrote Steinbeck, “and it looked very expensive. Probably the airplanes will bring weekenders from Los Angeles before long, and the beautiful poor bedraggled old town will bloom with a Floridian ugliness.” Steinbeck was referring to the Hotel Perla, and he need not have worried. La Paz was not ruined, old Perla is still entertaining guests, and though several new resort hotels, villas, and condo complexes dot the adjoining landscape, there is little ugliness of any sort. Puerto Escondido, literally "hidden harbor," has a tidy marina run by the Mexican government. To make the round-trip in our allotted number of days, I determined that Day One would be our longest passage, about 85 nautical miles. With conditions of total calm, and a boat that cruised happily at 10 knots, this was pure pleasure. With plenty of daylight, we had time for little detours. 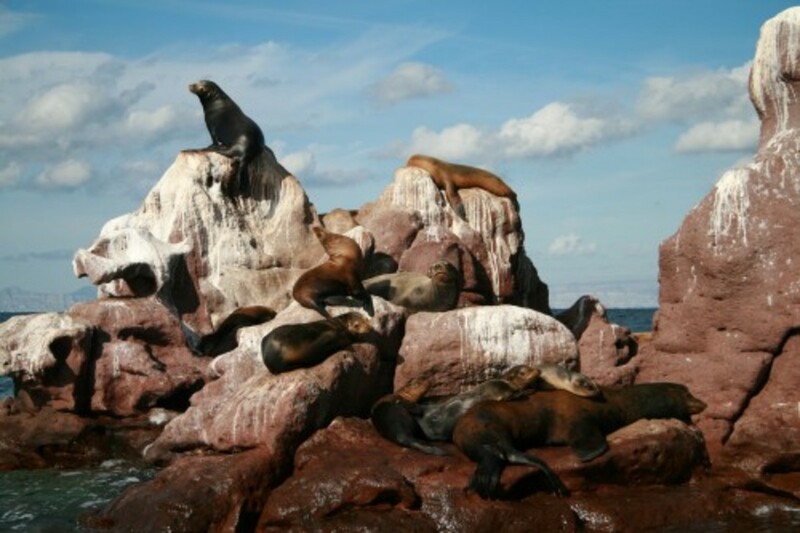 First we nosed the big cat up to Los Islotes, rock outcroppings where boatloads of tourists come to swim with sea lions. Steinbeck and Ricketts, with their ideas about inter-species relations, surely would have had something to say about that. Personally, I would never get in the water with a single sea lion, let alone a platoon of them, though we watched a gaggle of happy campers doing just that. The sea lions, I’m told, hardly ever bite the tourists, and everyone involved in that day’s mammalian lovefest seemed to be getting along …well…swimmingly. Shortly after turning our bow northward again, we saw a big stingray near the surface, then a pod of pilot whales. Looking rubbery black and keeping close together, the pilots were our consolation prize for not having chartered during the winter months when grey whales are everywhere. Next we nosed up to Isla Coyote, the smallest inhabited island in the Sea of Cortez. A clan of fishermen lives in a neat little village there, built atop what looks like a sloping flat rock. 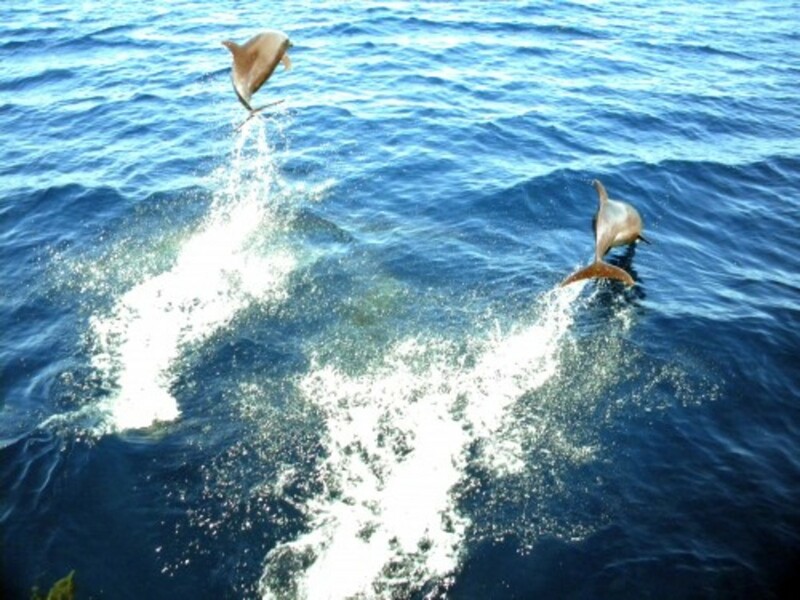 Then we saw dolphins by the hundreds, as we did every day thereafter. This dolphin army cavorted all around us, many launching themselves high out of the water to get a better look at us. By the dozen, they took turns rubbing their backs against the water displaced by our bows. They seemed genuinely happy to see us, unlike their Floridian cousins, who seem to have become indifferent to our presence. Despite our unfamiliar surroundings, and whatever my earlier musings might have suggested, the crew of Costa Baja 1 felt totally tranquilo while under way. Sitting on the flybridge, we felt any lingering tension dissipate as if we had just exhaled a deep breath. We were in the shade, and though landward it may have been 100 degrees, our own apparent wind, added to a few knots of northeasterly breeze, kept us cool. We glided into Puerto El Gato, at 4 p.m. and anchored near the bay’s most distinguishing feature, a rock slope that looked like giant toes molded from red clay, left out in the rain, then baked. Steinbeck’s expedition had dealings with native people, described as Indians and paddling dugout canoes. We met our version at El Gato in the form of Manuel the Fisherman. When we arrived at El Gato, he was putt-putting around the anchorage in his outboard-driven panga. He stood off and watched us anchor. Even a rural Mexican fisherman knows you need to watch out for those charter customers, and when he saw the hook had set, he signaled to us that we had done a good job. Then he came alongside and introduced himself. “Are you interested in having some lobsters for dinner?” Manuel asked. No thank you, I said, exercising my Spanish, but do you have any clams? “Clams? I would get you some ‘chocolates’ right now,” he said, “but I am 74 and have a difficult time diving.” A “chocolate” is the local version of what New Englanders call a “quahog,” though its shell is not grayish, but brown like a Hershey bar. 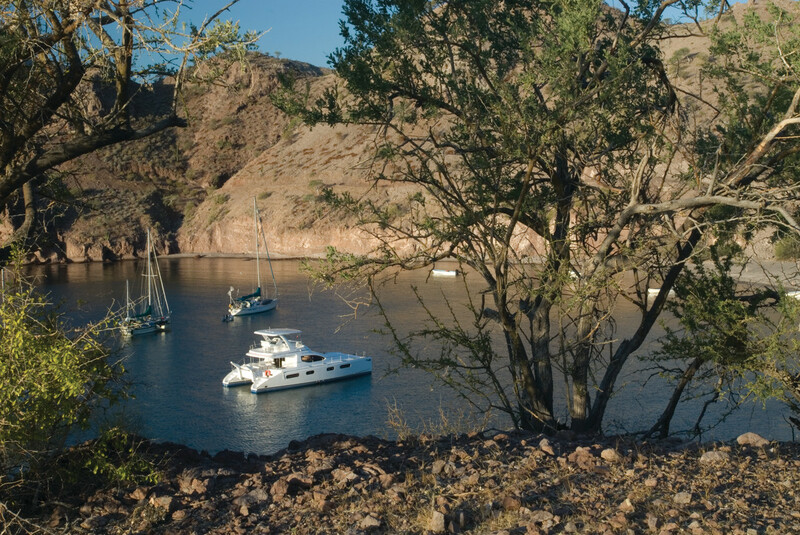 From cruising sailboats to big motoryachts, the Sea of Cortez is a major cruising ground for California mariners. After Manuel left, the bees arrived. Our briefer at The Moorings had warned us they would come. Not every bee in the desert is assigned to flower duty; some are sent to collect water, which they regurgitate to be shared or used for cooling purposes back at the hive. Apparently a boat under way collects puddles of fresh water too tiny for us to see, but big enough to fill a bee’s gut. Dousing the boat in salt water, our briefer told us, keeps them from coming, but that had seemed like a lot of work to us. Now they were swarming into the main saloon, and we faced a dilemma. Earlier, I had decided we would not run the air conditioner that night—and therefore the genset—in deference to our neighbors in the anchorage. I knew how annoying it was to be in a hot bunk and unable to sleep because of the throb and splash of a generator from a boat whose occupants had the thermostat set to 62 degrees. Now, we were closing all the hatches and doors because of the bees, which made the interior unbearably hot. We moved as far from the other boats as possible and ran the air conditioner. Eventually the bees retreated, and we cooked a couple of steaks on the grill and settled in for the night. Manuel came alongside and held up the mesh bag full of clams. I asked him how much for 20. As most of the negotiating world learned long ago, you never answer this question from a gringo directly. “Give me what you think they are worth,” he said. 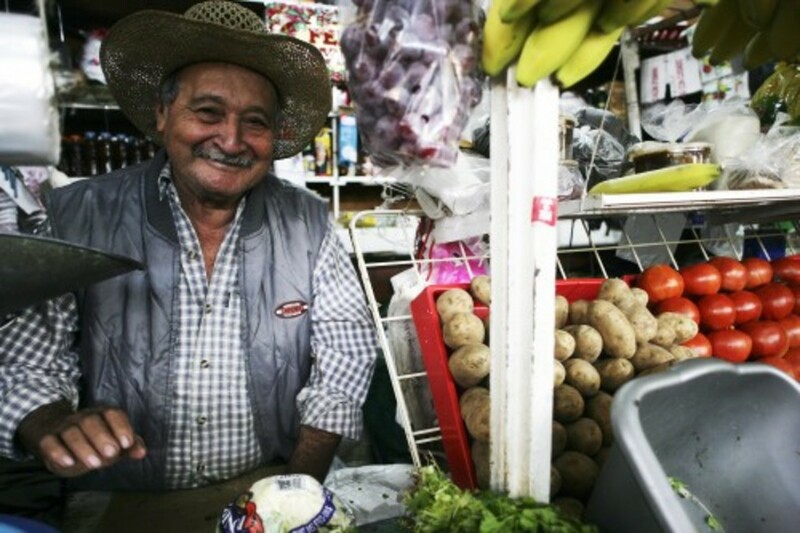 Twenty years ago, I had bought 20 steamed clams for $4 in San Felipe, but that was 20 years ago. I proposed paying 20 U.S. dollars for the clams. He raised his right hand, and seeing five fingers, I thought he was upping the ante. Okay, I started to say, I’ll pay $25. “No, no, amigo. High fi, high fi!” Manuel said. Ahhh…I get it, high fives! With the slap of our hands we had a deal: a buck a clam. For another $15 we bought a beautiful little souvenir pillow that Manuel’s wife had decorated with intricate needlepoint flowers. “She spent an entire week doing that one,” he said. A few hours later we dropped anchor at Isla Danzante, at a lovely little anchorage called Honeymoon Cove. When we arrived we saw two small stingrays leap high out of the water, but they were not merely jumping. 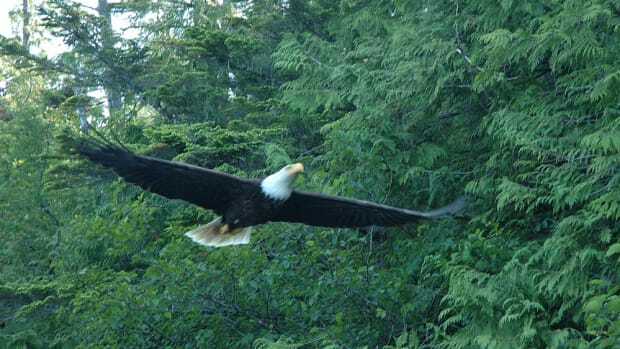 While airborne, they actually flapped their “wings,” and even seemed to be gaining some air traction (“I think I can. I think I can.”) when gravity pulled them back into the turquoise waters. We had stopped for a swim and a leisurely lunch of steamed clams, since the cove was just 3½ nautical miles from Puerto Escondido, our destination on the “mainland.” I served the clams just as they had in San Felipe, on a tray with a cup of melted butter at center, slices of lime lining the outside edges, fresh cilantro leaves sprinkled over the open shells, and with bottles of hot sauce and two frosty Pacifico beers on the table. The clams were good but chewier than my recollection of the San Felipe variety, which more resembled our New England quahogs. Cherrystones or littlenecks (depending on the quahog’s age) are a sweet little amorphous mass of pale pinkish yellow flesh. Inside its shell, a “chocolate” seems to have a number of parts and pieces either absent or unnoticeable on a steamed quahog. This includes an appendage that looks like part of a squid and, most noticeably, something resembling Kiss front-man Gene Simmons’ tongue, only redder. At Puerto Escondido we took one of 115 moorings installed in a large, perfectly sheltered harbor. Operated by the Mexican government’s tourism bureau, Puerto Escondido turned out to be a gem of a facility. It had a fuel dock, slips for another half dozen boats, a haul-out yard, a cruisers’ lounge with wi-fi, an excellent exchange library operated by the local ex-pat “yacht club,” a small store, and an on-site restaurant. 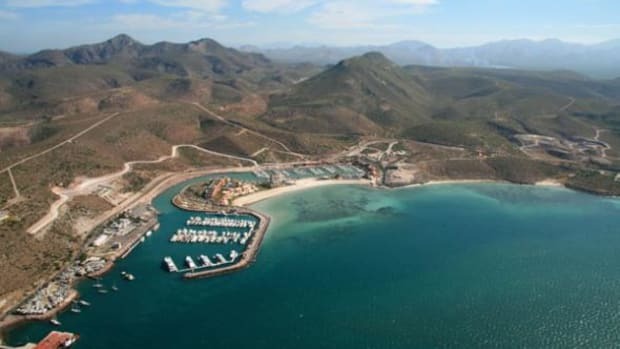 For years the Mexican government has championed the idea of a “nautical ladder” of marinas spaced along the coast of Baja and the Mexican mainland on the Sea of Cortez. Puerto Escondido was one step of that ladder. While waiting for our cab to Loreto, we found a gathering of local cruisers in a breezy spot between buildings. The conversation among these Californians turned to whales, each story topping the one before. California may have a lousy coast for boating, but boy does it have whales. My favorite was an anecdote about an orca—apparently we are not supposed to call them killer whales anymore. This orca liked to “spyhop” right beside the cockpits of anchored sailboats, like a kid sneaking up and shouting, “Boo!” behind the sailors’ backs, a killer story if I ever heard one. Like La Paz, Loreto is an old colonial town, albeit smaller. We enjoyed walking down its tree-shaded market street and along the breezy malecόn. Before returning to the anchorage, we drank Margaritas at Augie’s on the malecόn, a restaurant and pub that will cook your catch to order. Tailhunter’s, a similar gringo hangout back in La Paz, does the same. Tomorrow, we would catch our own fish and grill it, I promised. There was no shortage of them; ever since La Paz we had seen the silvery flashes of leaping tuna. And according to the guidebooks, August was the best month of the year for both yellowfin and dorado, and it doesn’t get any better than that. 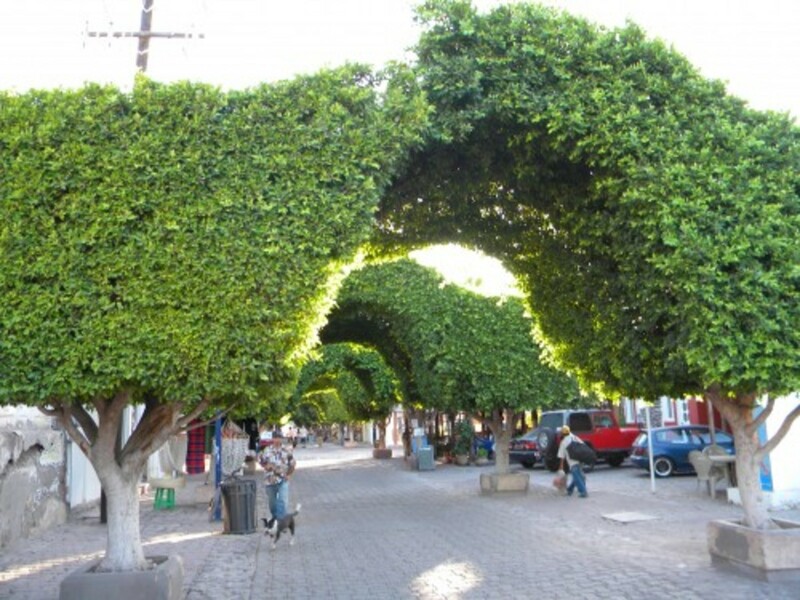 Loreto&apos;s commercial main street is shaded by topiary arches. Leaving Puerto Escondido we were now officially on the return trip to La Paz. We went around the north and down the east side of Isla Danzante because our chart, annotated for anglers, said the drop-off there would be good for dorado in summer. I had packed a hand line and a couple of lures in our luggage. The “Cuban reel,” as it’s called in Florida, was a circular assembly made of plastic with finger grips on the inside of a rim wound with line. Letting out a couple of hundred feet, I hung the reel over the faucet at the flybridge sink. In one position, the spigot locked the reel in place. By rotating the spigot 90 degrees, the reel would release to pay out more line, even making a clunking drag-like sound as the finger grips rapped against metal. Despite the chart and sophistication of our gear, we had only one strike and no hookup. We arrived at our next anchorage, Agua Verde, with grilled chicken on the menu. 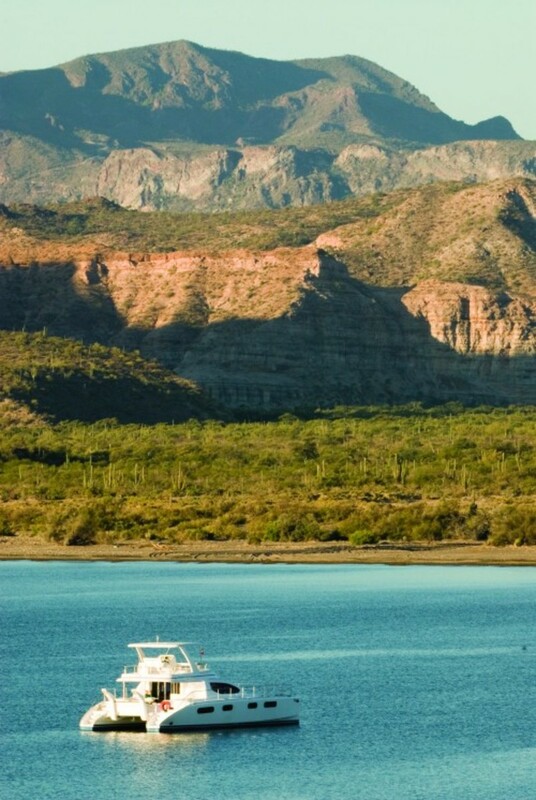 Agua Verde was another beautiful bay set against a backdrop of mountains, with a tiny fishing village along its shore. With the sun falling low in the sky and the air cooling, we watched in fascination as a herd of 50 or 60 goats moved from one rocky hill to another. Every time we thought the lead goats had miscalculated and could proceed no farther because of a drop-off or barrier, they managed to find a precarious way forward, and the herd followed. We had watched this show from the “brows” of The Moorings powercat, a series of steps in front of the windshield that provide both exterior seating and shade for the saloon. We returned after dinner with glasses of wine to gaze at the night sky, which shone more intensely than possible in the polluted (and light polluted) skies over the East Coast this time of year. I pointed out the communications satellites orbiting overhead, and even though the Perseid meteor showers had happened a few days earlier, the shooting stars were numerous. Shortly after departing Agua Verde the next morning, we once again unrolled our line and lure. Soon we could see the flashes of silver jumping from the water around our faux squid. The clattering of plastic against chrome signaled “fish on” as the line ran out. Throwing the engines into neutral, I retrieved reel from faucet. To my relief the strength of the tugs suggested that we had hooked a fairly small specimen. Passing the line down onto the aft cockpit, I went down and slowly “reeled” the fish in. Lifting our tuna onto the aft-most “sugar scoop” of the port hull, I could see it was a perfect fish for two people, just over 2 feet long. I gripped the tail with a bath towel (sorry, Moorings) and poured Tequila down its gills. Alcohol is a non-violent way to dispatch a fish, which, having imbibed, promptly takes a one-way trip to pelagic Margaritaville. Speaking of which, we put the Tequila to use again that night. After dropping the hook at Isla San Francisco in a circular bay called The Hook, we tried a new Margarita recipe using available ingredients. Combining fresh slices of mango, lime juice, ice, and tequila in the ship’s blender, we discovered, will produce a creamy, fruity, and most excellent sundowner cocktail. I had cut our tuna into steaks, then marinated it in lime juice and pepper. Clearly we had enough meat for one or two more people, so I should have gone ahead and chunked the steaks by cutting away the spine and bony parts altogether. Grilled until it was pink in the middle, our little tuna was superb, bones and all. I shone a light off the stern as we tossed the leftovers overboard, and we watched as thousands of small fish came to share our meal. Were they young dorado? Maybe so. Next morning we dinghied to the beach and hiked the ridge of hills surrounding the bay, where four other boats lay at anchor widely spaced along its shore. After a last swim, we set off on a leisurely cruise back to The Moorings base for one last night in the City of Peace. 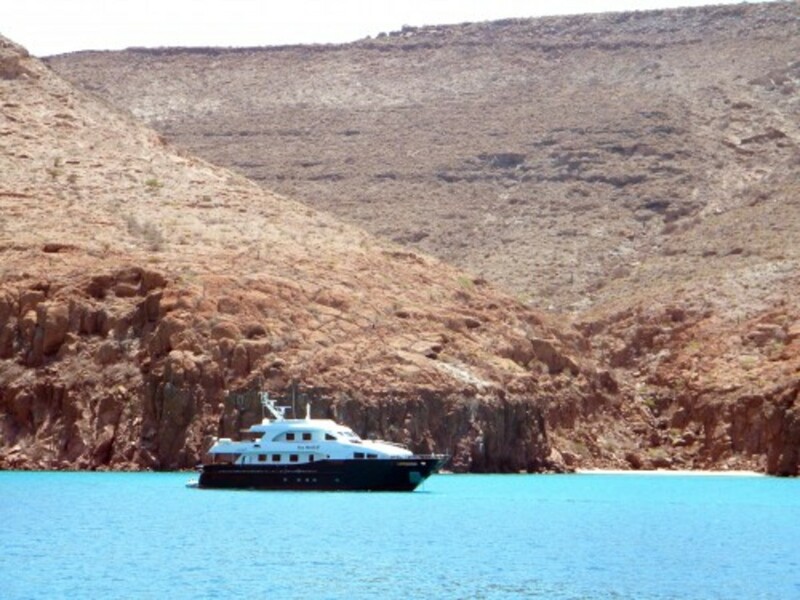 En route, we nosed into the various lovely anchorages on Espiritu Santo, an island about the size of Manhattan just a few miles outside La Paz. If you ventured no farther than Espiritu Santo on a charter, it would be a week well spent nonetheless. After backing the big cat into its berth at Marina Costa Baja, we had time to reflect on our short voyage. 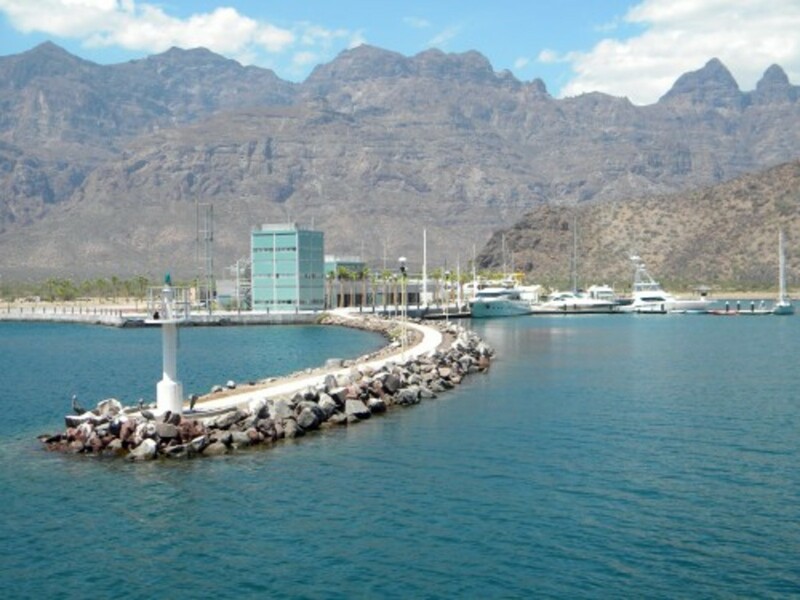 We were grateful that The Moorings had made the commitment to a base at La Paz, because getting a couple of East Coast people out on the Sea of Cortez would have been unlikely, if not impossible, otherwise. We were also grateful for the quality of the food and drink in The Moorings provisioning plan. That and the superb restaurants of La Paz made for a great eating experience. “This trip had dimension and tone. It was a thing whose boundaries seeped through itself and beyond into some time and space that was more than all the Gulf and more than all our lives. Our fingers turned over the stones and we saw life that was like our life."